In Hollywood, a town that provided a lot of competition for shenanigans, he was one of the foremost cokies, alkies, crazies. At a Houston-area art event in the early 1980s, he nearly blew himself up with 17 sticks of dynamite. 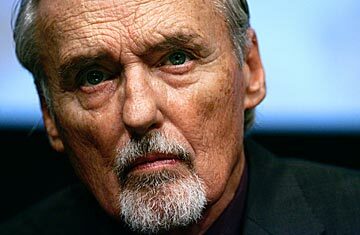 Given that for a couple of decades he seemed bent on killing himself for pleasure's sake, it's a wonder that Dennis Hopper had such a long success in movies  more than 50 years  and so many other pursuits. Actor, director, noted photographer and art collector, he died today at 74 in Venice, Cal., after a long, public battle with prostate cancer that gave Hopper, so long addicted to melodrama, one last role in the spotlight: on the Hollywood Walk of Fame. When your first movie role is as "Goon" in Rebel Without a Cause, tormenting James Dean, with whom you become close friends... and, when you're 22, your Method misbehavior so exasperates old-line director Henry Hathaway that he blackballs you from feature-film work for seven years... and when Easy Rider, the little movie you directed, co-wrote and starred in, makes a bundle and becomes the definitive fracture point in the Hollywood studio system... and when your next directorial effort, The Last Movie, is taken as a bird-flip to the industry and crashes like the Hindenburg... when, in your later roles, you're the least stable character in some very strange and wonderful films, out-nutsying Marlon Brando in Apocalypse Now and Isabella Rossellini in Blue Velvet... and when you are found naked and raving on cocaine psychosis in the Mexican jungle. then, even if you're a teetotaler and a Republican (both of which Hopper became in the mid-'80s), you will attract attention. Hopper's movie work is both a cautionary tale and an exemplary one. He brought a tortured authenticity to many of his acting roles, an almost surreal intensity to the films he directed. He was wed five times, including an 8-day whirlwind with the Mamas and the Papas' Michelle Phillips ("The first seven," he said, "were pretty good"), and he filed for divorce early this year from his fifth wife, Victoria Duffy, alleging she was "insane" and "volatile." She countersued, making similar claims about Hopper. Yet with myriad self-inflicted notches on his pelt, the self-described middle-class kid from Dodge City, Kansas, somehow survived, and thrived, until he was something of a Hollywood elder statesman. Growing up in Kansas City, Mo., Dennis Lee Hopper studied painting under artist Thomas Hart Benton, and moved to San Diego with his family when he was 13. Five years later he was in movies, appearing with Dean in Rebel and, as the son of Rock Hudson and Elizabeth Taylor, in Giant. His intransigence on the set of From Hell to Texas, where Hathaway had him shoot the same scene 80 times, got him out of movies. (Hathaway declared the embargo over by hiring Hopper for the 1965 The Sons of Katie Elder.) Meantime, he did dozens of TV shows and a Broadway play, Mandingo; his 1961 marriage to a fellow cast member, Brooke Hayward, lasted until 1969. That was a big year for Hopper, and the new Hollywood he helped hatch with a picture called Easy Rider. In 1967 Hopper had appeared in Roger Corman's LSD movie The Trip, starring Peter Fonda and written by a sometime actor named Jack Nicholson. Easy Rider, which Hopper wrote from a story that he and Fonda had talked out, blended the psychedelic genre with the biker movie and turned its cross-country drug dealers, Captain America (Fonda) and Billy (Hopper) into hipster-martyrs. It also handed the scene-stealing role of an amiable lawyer to Nicholson, earning him an Academy Award nomination for Supporting Actor and speeding him toward stardom. Even more surprising was that the script, a ramshackle thing of improvs, longueurs and excesses, got an Oscar nomination too. When Hopper decided to keep editor Donn Cambern's temp track, Easy Rider became of the first movies to wallpaper its sound track with rock songs (The Byrds, Steppenwolf, Jimi Hendrix, The Electric Prunes). Made for about $1.4 million, most of it spent on securing rights to the songs, and released more than a year after it was shot, Easy Rider grossed a robust $19 million at the U.S. box office. In doing so, the movie rewrote the rules of Hollywood moviemaking. Rather it said there were no rules; just do your own thing, man. The film's financial success proclaimed that the studio system was dead, and that the town's burghers knew nothing about appealing to the suddenly-crucial youth market in the crest of the Vietnam era.